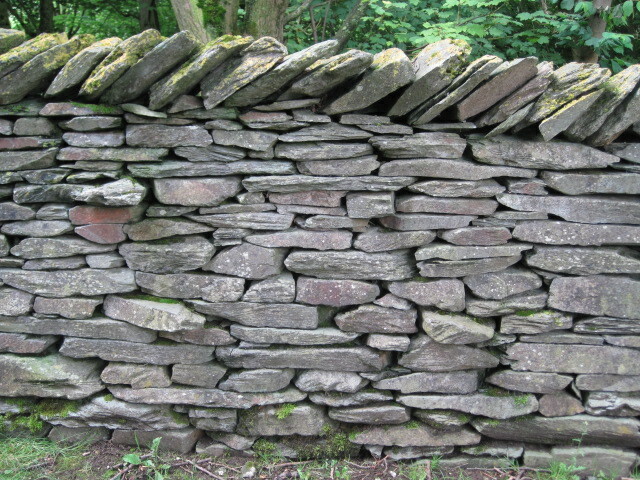 To me, there are few things more beautiful than a well-built dry stone wall. 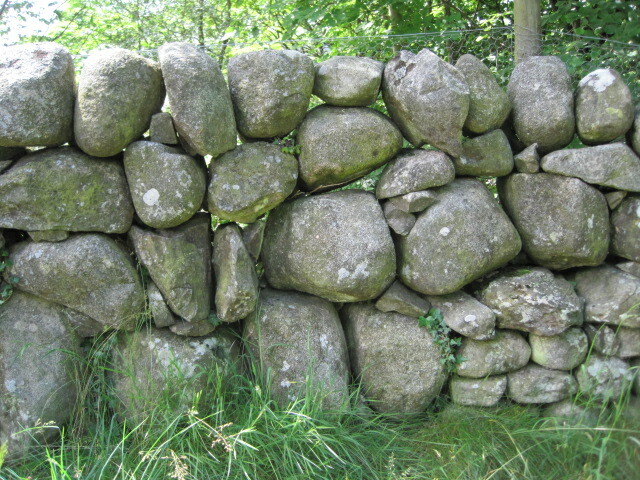 A stone wall is a work of art, every stone placed there by someone who weighed its dimensions in their mind, hefted it in their hands, and put it where it needed to be and where it would remain for two hundred more years, without the benefit of mortar to hold it in place. 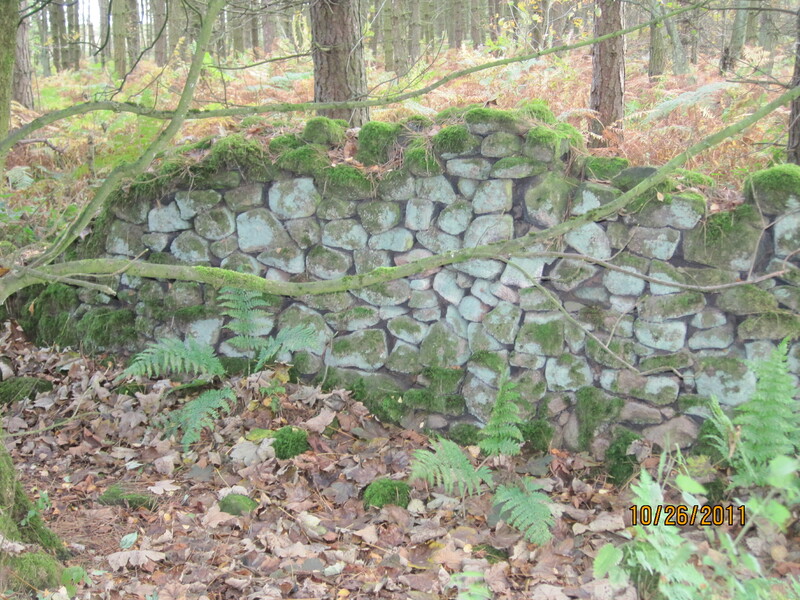 An abandoned wall in the woods above Cromford, Derbyshire, still standing after 200 years. 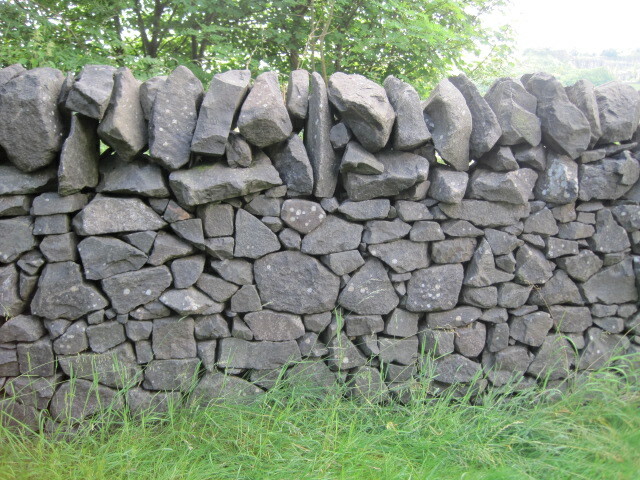 My grandfather, a Derbyshire farmer, built–or mostly rebuilt–a lot of stone walls. He told me that his job was to put the wall back as when it was first built, finding the right place for every stone. 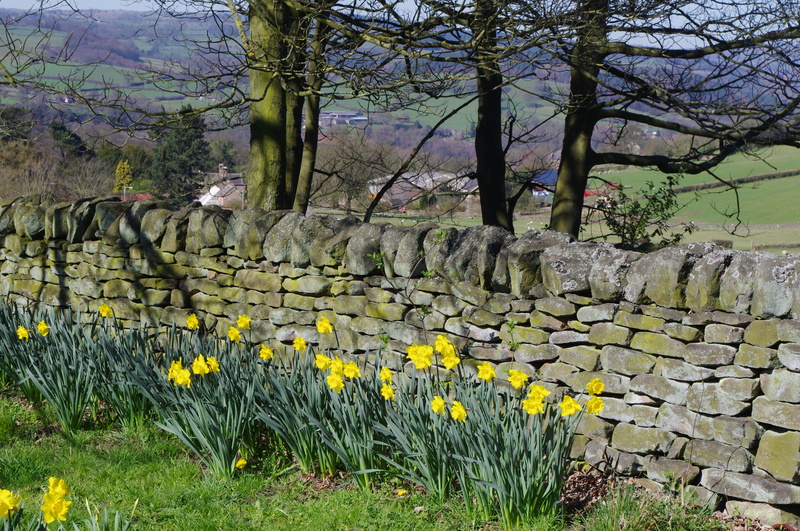 Derbyshire abounds with dry stone walls; gritstone (sandstone) walls in the Dark Peak, limestone walls in the White Peak. (If you look at the photo at the very top, you’ll see the limestone dome of Crich with the tower (Crich Stand) on top, and the church of St Mary’s, made of gritstone.) Britain has 125,000 miles of stone walls, many of which are now falling down. Wall-building is an ancient art, and one that takes years to learn in order to do a good job. “Master wallers” are in high demand, and can command up to 300 pounds per meter (roughly three feet) of completed wall. Last weekend I went to the National Stone Centre in Middleton-by-Wirksworth, Derbyshire, and had a delightful morning looking at a series of walls that were typical of different parts of Britain. I would like to offer my deepest thanks to them for allowing me to include this material on my blog. For far more extensive information than I can provide here, please go to their website. I might also mention that they offer weekend courses in wall-building, which I hope to take next summer. 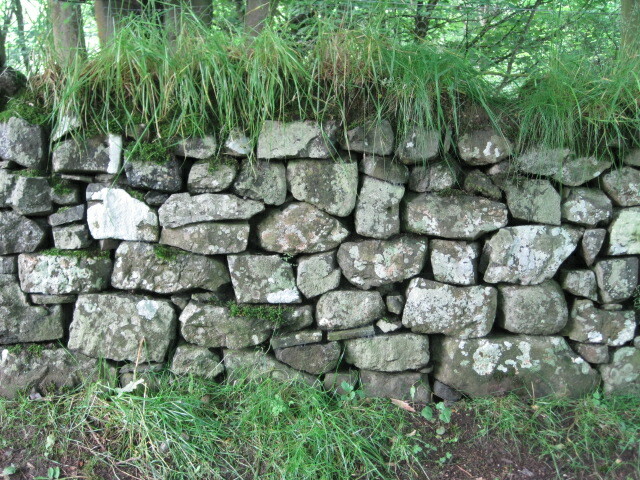 A typical Cumbrian wall with many “through stones” and courses (horizontal levels). The coping stones (the ones at the top) slope downhill which prevents them from slipping. A typical stone dyke from the Isle of Skye, Scotland. The very top level, the “cope,” can be made of rubble (small stones) or turf, as seen here. 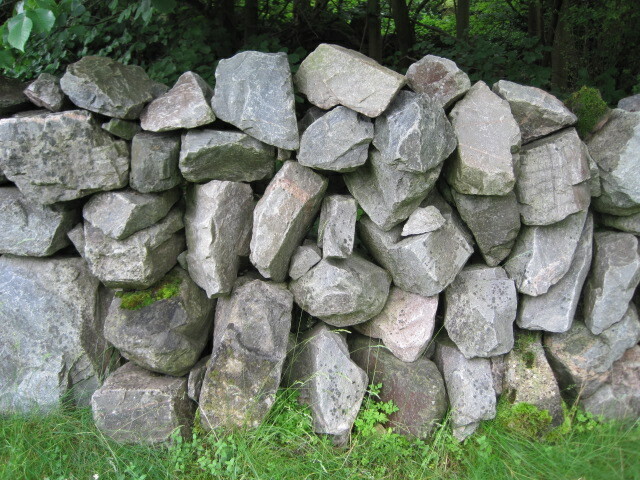 On walls in Derbyshire, the cope is made of stones with rounded tops that are placed vertically. 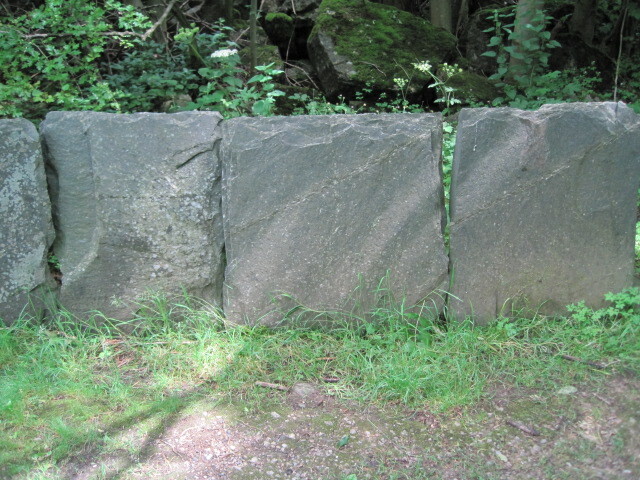 Cumbrian slate fence/wall, which is relatively rare. Galloway boulder dyke, southwest Scotland, using huge, rounded boulders. Daylight can be seen through these walls, which is believed to make animals unwilling to jump the wall. Random double dyke, southeast Scotland. This is perhaps my favorite of all the walls because of the irregular stones and the cleverness of the waller in making their shapes work together. 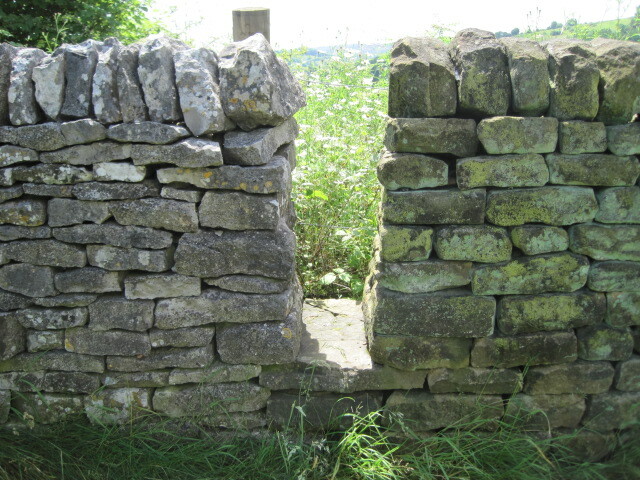 Two types of north Derbyshire walls, limestone to the left of the stile (the gap in the wall for people to pass through), gritstone to the right. Limestone is more irregular and often has fossils from being part of a tropical sea 33,000 years ago; gritstone has grains and more regular coursing (horizontal levels). So many walls are falling down throughout Britain because farmers and others don’t have the time or expertise to rebuild them. 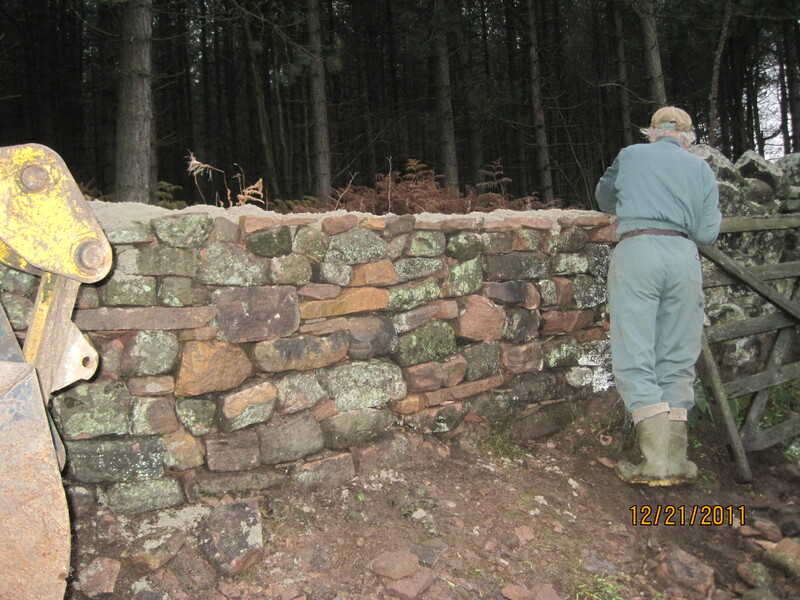 My uncle Frank mends a wall that was damaged by his bullocks. Thank goodness there are still some people, such as my uncle Frank and his son, and my cousin Gordon and his two sons, who are capable of mending their own walls. Without them, there would be far fewer walls, and much more barbed wire throughout the countryside. Neat. I’m sending this one to my Bavarian bricklayer ex. Thanks! I hope he enjoys learning about how some Great Britons make their walls!